What We Agreed to Do: Congregations and Individuals – Ye watchers and ye holy ones . . . I may have missed a few Resolveds here or there, but this ratio should be fairly accurate. Since General Convention is the official legislative body of the larger church, it is appropriate that the bulk of the decisions relate to our common life. However, our common life together would be strengthened if General Convention developed more of a culture of action, encouraging congregations and dioceses to take particular steps in response to the actions of Convention. For example, many well-crafted and faithful social justice resolutions were approved by Convention as positions of the church, but did not ask anyone beyond 815 to do anything – not even pray or advocate. A092, for example, affirms support for full and adequate funding of social safety nets like Social Security. While it may be helpful to make a statement like this, our mission would have been strengthened by encouraging specific action in response to this position – like urging congregations to develop relationships with people who depend on these safety nets. Contrast this with A096, Affirm Relationship Based Social Justice, which encourages all Episcopal congregations to establish relationship-based, social-justice ministries through which relationships are developed between those who serve and those who are served, resulting in shared and transformational experiences and in a greater commitment to work for justice on all sides of the socio-economic divide. This is not simply a matter of semantics. This is a call to live what we say, to let our yes really be yes. If a matter is worth a resolution, it is worth a statement about how we are called to respond. If you’re interested, here are several resolutions that made a bold statement for the church but don’t ask individuals, congregations, or dioceses to do anything. Be aware that titles are assigned before Convention and can’t be changed, even if the discussion ends up leading the committee in a direction not reflected it the title. A094 (Support Income Tax Parity), A170 (Develop and Continue Food System Advocacy), B013 (Peacemaking Through Political Action – focused on Israel and Palestine), C005 (Decreasing Gun Violence), C013 (Facilitate Dialog on Climate Change and Divestment Strategy), C053 (Protecting Indigenous Subsistence Rights and Native Food Sources), D028 (Oppose Conversion Therapy), D032 (Disability Advocacy in Criminal Justice Work), D033 (Supporting Refugee Rights in Central America), D048 (Support for Certain Immigration Relief), D069 (Birthright Citizenship), and D074 (Temporary Protective Status for Immigrants at Risk). That being said, here is what General Convention currently asks of individuals and congregations. (Current versions and status of resolutions can be found here . The official journal is not yet available, so some of this may still be subject to change). A011 – Recommit to Criminal Justice Reform and Advocacy – Encourages each congregation and Diocese to undertake at least one specific initiative aimed at addressing the destructive consequences of the mass incarceration system and includes a list of possible actions. A020 – Affirm the Work of The Episcopal Church at the United Nations – Asks all Episcopalians to educate themselves about the work of the United Nations and the many ways in which our collective call as Christians to “seek and serve Christ in all persons” aligns with the work of the United Nations, and to support and partner with the United Nations and its programs and agencies in pursuit of peace, reconciliation and justice for all people. The General Convention is not the will of the Episcopal Church and thus has no real moral authority over rank and file. 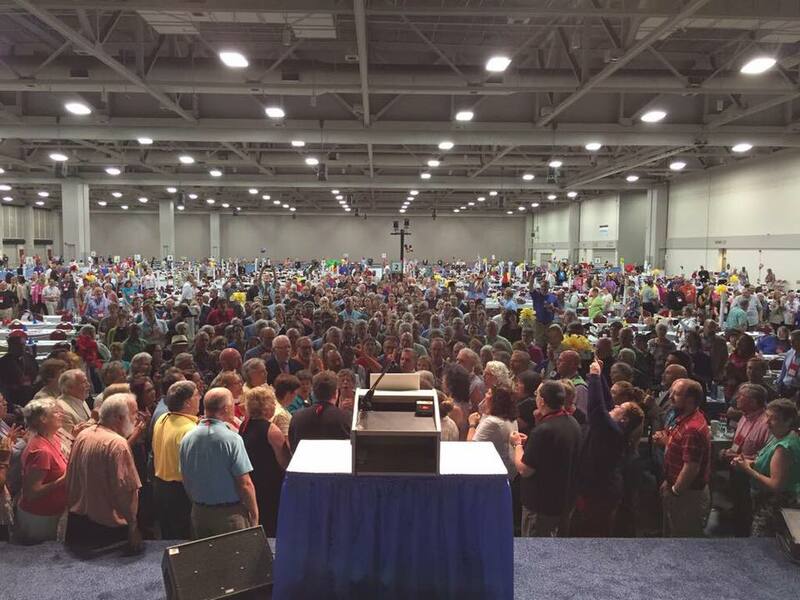 Until the Episcopal Church recognizes that it lacks truly deep relational Christianity within its own dioceses and provinces, the GC will continue to express an unenforceable but more importantly unrecognizable vision for life in Christ that doesn’t resonate with the few Sunday attendees it has left. We make pronouncements, pat ourselves on the back, and tell ourselves that we matter as an institution when we matter little to ourselves and less to the world in and around our parishes. GC, TREC, and all of the “work” they do is the continuing realm of the distant, strange and ideological. D077 is the perfect example! Who is going to do this work when our churches are barely capable of doing this for the people in their own parishes? D077 is a godly idea that can never be disputed, but the transformative work that reorientates parishioners in average parishes to this work is falsely presumed as being done with capacity to make D077 even slightly viable. Wonderfully helpful, Grace! I believe many of us will use this as our “cheat sheet” as we teach our congregations . . . A blast to see you at GC! In some cases, as in the Immigration related Resolutions, there are people already doing a lot of work in their parishes. They don’t need the Resolution to call for them to do something. But they are very grateful for TEC to pass a Resolution that supports their efforts. I can’t tell you what a difference it makes when I’m talking with a legislative aide, or with an immigrant family in my parish, to be able to say, “Our Church says this about TPS for immigrants at risk…” or similar statements on related issues. It is very empowering! I do see the value in having a position on an issue that is claimed by the larger church. But I think our positions would be strengthened by encouraging more action. Thanks, Grace…a very thorough job. Now all of us need to get to work.